Twice in the Cathreim Thoirdhealbhaigh we read of ‘Ruan of the grass-grown hollow uamhadha’; the latter word, locally pronounced Ooan, is used indiscriminately for a cathair or a souterrain. The first notice creates a difficulty, and may be a headless slip of memory; but the last, in May, 1318, undoubtedly refers to this district. Here Sir Richard de Clare camped for the night before the fatal Battle of the Ford before Dysert O’Dea. The epithet is most appropriate, for Ruan abounds in ring-forts; to attempt a complete survey might add rather to the length than to the value of my survey, so I will only select a couple of important groups, and a few other examples. The Liss names are numerous: Lisnabulloge, Lisbeg, Lisduff, Lisheen-vicknaheeha; the fort to the north of the last is locally Lisheenahuckera; Lisnavooaun, Lisronalta, Lismuinga, Lissyline, and Liscarhuanaglasha (Carhuanalashee alias Cahernamart in 1666). To complete the Liss names known to me in the adjoining parishes I give Lisduff, Lisvetty, and Lisheenaboughil in Kilnaboy, and Lissyogan and Liscullaan in Rath. No such names occur in the parishes of Kilkeedy, Kilnamona, and Dysert so far as I am aware. Three low earthen forts of no great size, and planted with hawthorns, lie to the east of the road from Teernea to Ruan. Lisheenvicknaheeha, ‘the little fort of the son of the night,’ is the most southern of these. This weird name may after all be simply derived from some former occupant, for the name, Mac na haidche, appears in our Annals from 1104 to 1281. I have not found it in later records, a fact which favours some age for the liss. The form (if correct) seems akin to the name Cahervicknea in this district about 1650. It is a very low little earthen fort studded with hawthorn bushes. This once fine cathair  is most probably the Cahervicknea of the Down Survey and other documents of the mid-seventeenth century: r and n are interchangeable in local phonetics, as Croch and Knock, Cahermacrole and Cahermacnole. The maps affix the modern name to a large oval ring of tumbled mossy stones in a thicket; the ring measures roughly 300 feet east and west, by 250 feet north and south, and (from the small amount of material anywhere remaining, the absence of facing and the lack of internal foundations) was probably an unusually large bawn, or cattle pen, against wolves. So far as I can find, no one attaches the name to it at present. The ring-wall, now called Cahermacrea, is I believe entitled to the name. It was an important, massive cathair of excellent masonry, carefully fitted, and of large blocks. The wall is 7 feet high for a long reach, the batter is usually from 1 in 7 to 1 in 12; its facing is inferior to the east, but gets better at the north-east, at which point are several upright joints, as at Cahercloggaun and ‘Caherbeg’ on Knockauns mountain. Some of the facing blocks are 19 inches by 11 inches by 16 inches up to 36 inches by 12 inches by 16 inches. The wall is about 9 feet thick with large filling, but the inner facing was of small blocks and, as so usually, has collapsed. The garth is 110 feet across; the fort being about 130 feet over all, and, being thickly planted, all traces of house-sites are gone. Parts of the outer wall have been rebuilt to protect the trees, and all trace of the gateway seems removed. Beside the road leading southward leading to Addroon (the site of a very curious dolmen formed of high pillar slabs), is a thickly overgrown and nearly levelled stone-faced earthwork. It has a fosse 12 feet wide and only a few feet deep, and slight rings almost obliterated to the north. There is a straight souterrain in the garth in a thicket of hazels; it lies north-west and south-east, the walls being of small masonry roofed with shapeless surface slabs. It is nearly filled up. The road has cut into the rings along the south segment. A small defaced fort, Lisbeg, lies west from it, and to the north at the cross-road is Kilranaghan, a large levelled ring 200 feet across. Lissyline, north from Ruan, is a very low earthwork, somewhat oval, 250 feet north-west and south-east by 230 feet, with a shallow fosse, the mounds regularly set with hawthorns. To the south-west is a defaced normal liss called Lisheenamuddagh, a low fort with a bank and fosse; its diameter is about 110 feet over the bank. On the grassy ridge south from the village and ruined church of Ruan is a cathair commanding an extensive view to the Glasgeivnagh Hill round by Callan to Aughty and Slieve Bernagh, the ramparts of the eastern plain of County Clare. The ring was stone-faced, and is now rarely over 4 feet high, consisting chiefly of heaps of field stones with foundations of the outer facing of large blocks and more rarely traces of the inner face. This wall was from 15 to 18 feet thick, and enclosed a garth 183 feet east and west, 177 feet north and south, and 217 feet over all. It is strange that this evidently very important fort is nameless. The garth is levelled inside, being raised like a terrace 5 feet over the field to the south-east and lowered a couple of feet to the north. There was an inner house-circle, the wall 9 feet thick, and still over 3 feet high, extending for about 114 feet in the south-west segment. Another defaced enclosure lies beyond it to the north-west of the garth. In the centre of the fort is a souterrain of some interest. It is L-shaped in plan, the longer limb lying north-west to south-east. The southern entrance is 2 feet by 3 feet wide; the passage 17 feet 8 inches long and 4 feet 6 inches wide; at 8 feet it narrows to 15 feet 3 inches from the ope: this narrow passage being 2 feet 3 inches to 2 feet 10 inches wide. In the right (north-east) side is a recess 18 inches square, which, like a shallower recess opposite, was evidently for a doorpost. 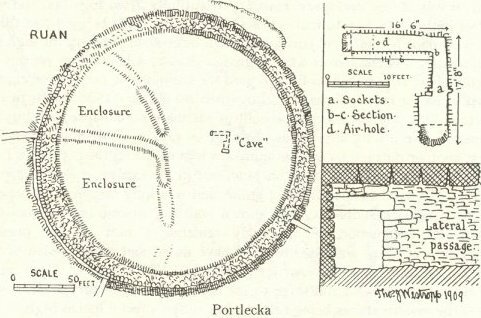 This is, I think, the only case I have found in this barony, though there are set stones perhaps for beam sockets in other souterrains. The passage turns at right angles to the south-west, being 5 feet 5 inches high at the turn. The next wing is 16 feet 6 inches long: the side walls are as usual of small masonry, with no cornice ledge such as we find at Mortyclough and Ballyganner. The souterrain is roofed with large slabs of limestone. There are two large slabs and four lintels over the outer passage, and seven over the inner, at two places are carefully arranged little openings, evidently shafts for air and light. Three entirely defaced ring-walls lie between this fort and Dromore Lake in the townland of Portlecka, and another lies in Nooan. This townland is interesting both as recalling the ‘grass-grown uamhadha’ of history by its name, and as having been once rich in early remains, now miserably defaced. Of three other forts, one has the stone facing of good masonry intact to the south-west, the rest nearly all removed by road-makers. The souterrain lies in the open field between the two eastern forts, and is nearly stopped up; its entrance has a large lintel 8 feet 10 inches long, 3 feet wide, and 1 foot 7 inches thick. There is no trace of any enclosure round it.